ETAP 18.1.1 includes new features and improvements to enhance software performance and the user experience. This upgrade adds to the extensive list of new features and capabilities of the ETAP 18 series. This release includes a built-in feature that automatically defrags and compacts ETAP library files to allow for faster library access and speed. This enhancement resolves the slow scan response of the library file by Windows Defender Antivirus program. Project load and save duration is shortened through enhanced use of files and memory, to speed up performance. Improved project access and backup reliability when connecting over a slow network. The speed of the calculations is improved through the implementation and use of new techniques. The run-time speed is noticeably faster on larger project sizes when performing Load Flow, Motor Starting, Harmonics, Harmonics, Reliability Assessment, Transient Stability and other analysis. 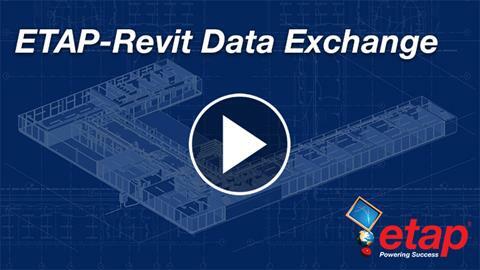 Information defined in Revit BIM is transferred and updated into ETAP to create an intelligent one-line diagram connectivity model including unlimited sub-systems with populated element properties. Conversion just got easier, faster & more complete! Are you still using scattered models and inefficient methods to maintain and analyze your critical electrical assets? The updated built-in conversion tool maps and converts the complete SKM PTW Dapper® & Captor™ project files into ETAP using detailed default parameters and flexible device library mapping. New calculation and result display of track-to-earth voltages based on train movement for comparison with EN 50122 standard for AC and DC railway power system. The speed to import and create track route information from Excel to eTraX is improved for large railway networks.